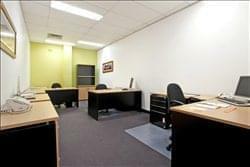 Find My Workspace lists over 95% of the serviced offices market in Alexandria (Sydney). Simply click Request Quote to check pricing for one office, or Add to Basket for multiple offices. Fresh and funky coworking space in Alexandria that provides entrepreneurs and businesses with larger offices, better services and greater value. This coworking oasis offers a calm, light and bright place to work, adorned with green plants, inspiring art and quality furniture to keep you energized all day long. Create synergies with other businesses and take your business to the next level from this gorgeous shared office in Alexandria, Inner Sydney’s up-and-coming creative mecca. With a private office space, coworking membership or virtual office, you gain access to premium meeting rooms with Chromebox, high-end Cisco infrastructure with 1000mbps, training facilities, reception services and printing, while your work is fuelled by unlimited fresh coffee and an uplifting outlook over Alexandria Park. With networking occasions and a Happy Hour every Friday, this workspace hits all the right notes between quiet focus and collaborative interaction – if you’re looking for something more cool, modern and sociable, book a tour to go and check out this affordable Alexandria coworking hub. The perfect spot for Sydney’s budding creatives, entrepreneurs, startups and dynamic businesses and, with no on-top costs beyond the advertised rate, it’s priced to meet your budget too. To obtain information for your selected Alexandria (Sydney) Serviced Offices, please tick the "Add to basket" box for each office you prefer and complete the form below. We will then send a detailed report via email.